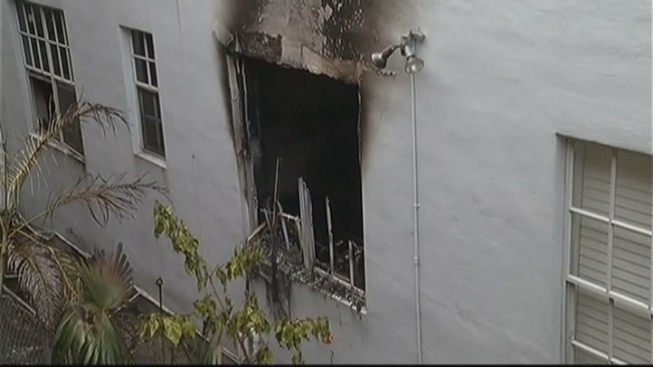 Two people were killed and two firefighters injured after a fire swept through a Miami Beach apartment building early Thursday, officials said. The fire broke out at the St. George Apartments at 605 Pennsylvania Avenue near 6th Street around 12:40 a.m., Miami Beach Fire officials said. One person was killed at the scene and a second person was taken to Jackson Memorial Hospital where they later died, officials said. Neither has been identified. One firefighter was taken to Mount Sinai Medical Center where he was treated and released. A second firefighter was treated at the scene for his injuries. 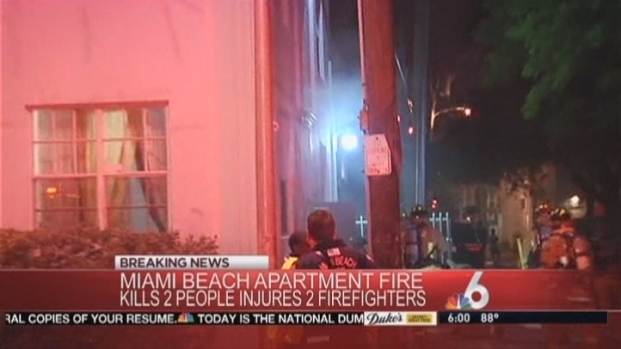 Two people were killed and two firefighters were injured after a fire broke out at a Miami Beach apartment building earlt Thursday. One of the victims who died in the fire had two dogs that were also killed in the fire. Officials said when firefighters responded to the apartment building, they found heavy smoke and flames. Neighbors said they saw the fire start in a first floor apartment. It then moved up to the second floor to a unit where a young man lives, neighbors said. "The guy that lives in the second floor, my step-dad was screaming at him to come out, but I guess he didn't have time," witness Bryan Coronel said. Ruben Vega and his son tried breaking windows but said the fire was just too intense and there was a lot of smoke in the hallways. "When my dad tried to open the door in the middle of the hallway, it was full of smoke coming from the whole building," Ruben Vega Jr. said. The fire displaced residents of 15 apartments at the two-story building, and the Red Cross was at the scene early Thursday assisting the residents. "We have 19 people who are displaced and will be displaced because of this fire, so we're providing lodging for them and food and clothing," Red Cross spokeswoman Patricia Rojas said.